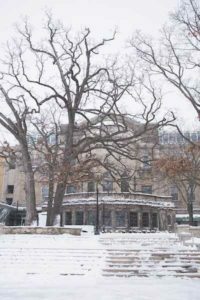 As fall colors fade, our facilities team at the Wisconsin Union has a long list of work to prepare Memorial Union and Union South for winter weather. Wisconsin Union Facilities Manager Joe Boss takes us behind the scenes of what changing seasons means for our organization. However, removing the Terrace chairs is only one piece of the puzzle. Other tasks the facilities team tackles within that two-week period include closing the Brat and BBQ Stands, winterizing and pressure washing Memorial Union and Union South, and closing water features. 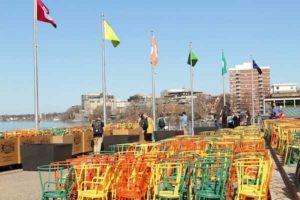 Among the winter preparation tasks, removing the Terrace chairs is the most time-consuming, Joe said. Even with the help of professional movers, the Terrace is an all-hands-on-deck kind of project. The removal process involves around 25 Union employees in addition to the movers. 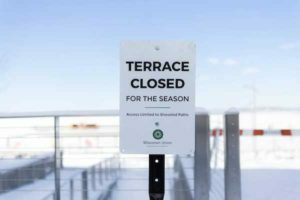 Throughout the winter months, the facilities team’s focus shifts to keeping our buildings safe, clean and preserved even with the increased foot traffic that cold weather brings. And before you know it, the facilities team will be at it again preparing for their busiest time of the year: spring. The team has to thoroughly prepare and anticipate for the spring return of the chairs and opening of the outdoor dining units, including cleaning and testing water piping. Joe and the team have encountered temperature fluctuations and obscure weather patterns in past years. 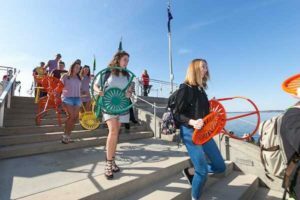 Although, typically, the sunburst chairs are back where they belong on the Terrace by spring graduation. More than 1,000 student employees, thousands of student leaders, and hundreds of other team members help make these transitions during the changing seasons possible. The next time you are at the Wisconsin Union’s Union South or Memorial Union, we hope you will take a moment to look for our incredible team members and their 24/7 efforts to make our buildings the best possible campus living rooms they can be. And to our Wisconsin Union members and guests, we thank you. It is an honor to serve you each day and create experiences for a lifetime. Learn more about the events you can enjoy year-round at Memorial Union and Union South: union.wisc.edu/events.